In the Gobi Desert the setting sun drops rapidly towards the far horizon, suddenly throwing long shadows across our camp site. It is 6.30 on Sunday evening, and just 30 cars have managed to find the patch of green some 20 kilometres away from Sainshand. We are pitching our tents yards away from the Mongol branch-line of the Trans-Siberia Express. We have spent a frustrating couple of hours hustling our way across immigration, and customs, of the Chinese border and into no-mans land, and then jostled our way into Mongolia. Some half a dozen cars were on the end of tow-ropes, or, pushed. It’s a heavy toll, no doubt about it. 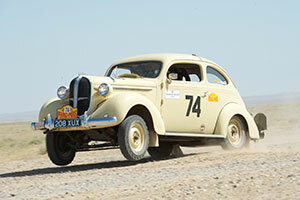 One of the most extraordinary stories to emerge was the effort of the Australians in the big Austin Sheerline. This car runs a four-litre version of the Austin Healey engine, originally designed for trucks and combine harvesters, and it ran its big end bearings yesterday. A workshop was found, and the bottom end of the engine stripped apart, to reveal a badly scored crankshaft, and wrecked shell-bearings. These were shimmed up and put back on with the crank having received much filing and polish with emery paper. To fill the gap – shims were made on the spot. One big-end was made out of cutting a strip out the side of a Sprite Lemonade can, and another was shimmed using the wafer thin aluminium from a cigarette packet. With this handywork, the engine was put back together and it drove into Mongolia under its own power this morning. Norman Brice and Colin Ryan deserve medals for this initiative of ace fettling. Once into Mongolia, we faced some rough going. This was not through choice – it was the only option. The main route to the capital of Mongolia is across the Gobi Desert, and the torrential rains that hit Pakistan six weeks ago moved on and drowned Mongolia with unseasonal floods, resulting in deep ruts, now baked hard as concrete now in the late summer sun. Three Time Trials – timed sections against the clock, timed to the second – faced competitors in the dash to our camp site. The two Volkswagens of the Americans, Garry Staples and his son, were both agile and quick, riding the rough impressively. The first car to arrive at the end of the day was the BMW 328 of David Rayner, which looked very impressive, riding the bumps and ruts in fine style, chased down by the bellowing exhaust of the big yellow Chevy Fangio Coupe of Steve Hyde and Janet Lynne. The Wilkinson’s Alvis crested the final bumps of the last Time Trial airborne-fashion. Billy Bolsover’s Chevy saloon was also yumping the crests in similar style. Jose de Sousa’s MG Magnette stopped with the rear spring mountings pulling out of the floor, and Clive Dunster stopped with electrical bothers with his Chevy, rapidly put right by Simon Ayris in the mobile workshop – the coil had packed up, but a spare had been fitted, which proved to be a duff unit. The Rolls Royce Phantom of The Reddingtons had two punctures, fixed by the Banhams, who thought they had been fitted wrongly back in Vancouver. Among the minority to find the campsite, there was a good buzz – the camaraderie among those who reckon they have had a “really good day” is running strong. However, we suspect this opinion might differ markedly with those who are still out there. Just finding this spot is no mean feat, made doubly difficult for those trying to get to the soup-kitchen in darkness. The Stutz of Andrew Bailey and Mickey Gabbet needed towing in across the moorland, with yours truly borrowing the film-unit’s pick-up. As our support-team set about cooking our evening meal – long green tents form our dining room tonight – Gerry Crown was pacing up and down inspecting the opposition, looking troubled. “Just wondering what we have to do to win this event,” says Gerry, who is here with Matt Bryson, son of a legendary Australian navigator, who have turned in a well-paced effort today in their Holden… until the results come out later, they are wondering if their effort to not go too quickly, too soon, has still kept them in touch with the hot-shots.